It's time for People's to grow and change. Over the next year, we'll be talking with our Member-Owners and our broader community to find out how we can better serve our current and future Member-Owners. Tune in to this page for updates and information. As we hear from Member-Owners about developments in the long-term planning process, we're responding to questions and concerns that we've heard from many folks on our blog. Check out those posts below, and find all of our blog content here. Our Ends are what drive our business, and in order to continue working toward them it's necessary to grow. We want to provide more access to our food, the co-op and collective structure, our human-scale workplace, and opportunities to participate in a democratic business, and we want to use the passion and heart of our communities to get us there. The popularity of natural foods in Portland and beyond is rapidly expanding. While co-ops used to be the only places that sold organic fresh produce, bulk foods, and natural body care products, conventional grocery stores all over are now doing the same. New Seasons, our biggest competitor continues to rapidly expand. The natural foods sections at Fred Meyer are growing larger than our whole co-op. Portland will continue welcoming large grocery store chains into the city, like Natural Grocers and Market of Choice. While People's has always stood apart from the competition because we express our deeply-held values in our product selection, the natural foods movement is gaining momentum, and many of the products previously sold almost exclusively by food co-ops are becoming more mainstream and accessible. As a result, food co-ops like ours across the country are struggling to compete. Our current neighborhood has seen dramatic changes the past few years. With an influx of new people, businesses, and apartments, our co-op’s small footprint is a limitation, now more than ever. As grocery stores get bigger, with larger product selections that include natural and organic, food co-ops like People’s are finding it harder to communicate why shopping here matters. In order to keep up with our expanding competitive landscape, we must prepare for the future - and that means growing. As a collective, a community, and a food co-op, we must ask ourselves how we can keep People's alive and thriving. While sales growth at the Co-op has leveled off since 2013, the boom years of 2007 to 2012, careful management, and our switch to a patronage dividend system have allowed us to save substantially. We're fortunate enough to be in a position to take on a new venture, especially at a time when we obviously need to do so in order to sustain the Co-op. As you may have noticed if you've shopped at People's, our store is small. This means that we can't carry all of the products that we might want to, sure, but there are other issues at hand. Narrow aisles mean that shopping here is often uncomfortable for people using wheelchairs or walkers, with other mobility challenges, or of a larger body size. We would rather provide a space that is comfortable and accessible to all. Further, our back stock space is cramped and overflowing, which makes working conditions uncomfortable for staff and Hands On Owners trying to maneuver boxes off of high shelves. We'd like a plan to address these challenges while keeping us financially sustainable. Considerable care has been taken to ensure that our long-term plan is created for our Member-Owners with the broader community in mind. The process we've developed provides ample space for input, feedback, testing assumptions, and finally creating a unified vision. All the while, we're keeping in mind that this process can't go on forever; we've mapped it out to make a decision about next steps in the late fall. Step 1 in our process is to Listen: We're beginning by inviting shoppers and Member-Owners whose voices are often heard last in the mainstream to take the center in visioning the future direction of the Co-op. We’ll also be meeting with a number of community organizations whose values align with ours to see how People’s can better serve the greater Portland community. Then, we’re on to step 2, Filtering Insights & Developing a Plan. Collective Management will narrow our focus even more before beginning research regarding the financial and business sustainability of the ideas gathered. We’ll get input from experts, and come back to the community for feedback on our plans to Test Our Assumptions & Validate Our Ideas (step 3). We’ll make necessary revisions until we get to step 4, when we Create a Thriving Vision Together and emerge from the process with a 10-year vision and plan for the Co-op! This process gives you, as a Member-Owner, shopper, or neighbor, the chance to share your experiences with us, and also to create and answer some deep questions about where best to put our energy and focus for the future direction of the Co-op. Help us create a path forward for the Co-op. Who is Guiding This Process? The Long-term Planning Committee or LTPC is made up of four Collective Managers who invest some of their time at the Co-op to facilitating the long-term planning process. That means that they help steward the Collective Management toward making a decision, talk to the Board about progress towards deciding on planning projects, host engagement events for Member-Owners and members of the community, write articles and other updates, and do lots of diverse research about how the Co-op can grow to meet our needs and work towards out 10 year vision statements and our Ends. You can be in touch with the Long-term Planning Committee by emailing them at planning@peoples.coop. 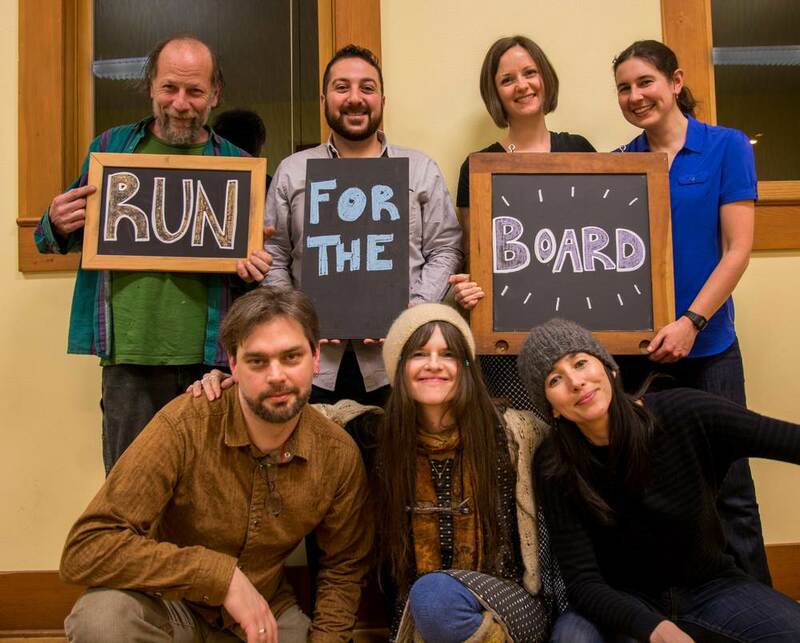 The Board of Directors is democratically elected group representing our Member-Owners. All of the Directors are intimately involved with and engaged in the long-term planning process, ensuring that the decisions we're making are legal, fiscally sound, and in the best interest of the Co-op. You'll see them at the engagement events and around the Co-op. If you have questions for the Board in particular, get in touch with them by emailing bod@peoples.coop*. *This email list includes all Board directors, as well as the staff links between the Board and the Collective Management. Member-Owners are a critical part of our long-term planning process! We've relied on them to help form the vision for our growth in the near and far term, as well as for lots of ideas of potential projects. Member-Owners have imparted important feedback throughout the process, and hearing directly from Member-Owners will continue to be vital moving forward. Member-Owners will also be a critical part of implementing our plan, from helping us find resources in the community to actually helping to finance our projects. The Co-op has also hired a few folks to help us guide our process, including a facilitator and a project manager. Questions? Feel free to send an email to planning@peoples.coop or contact the Board of Directors at bod@peoples.coop.